Hear ye, another giveaway for our toddler and kids! Definitely, they will love this! 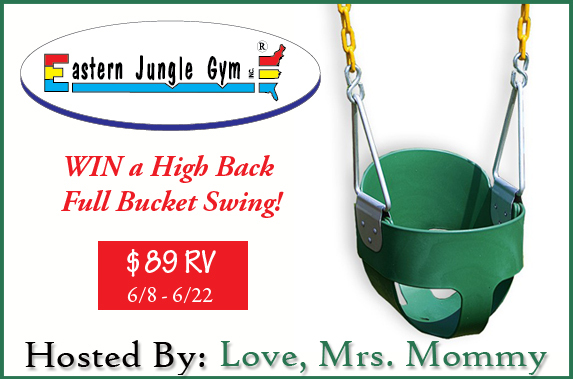 The High Back Full Bucket Swing is constructed of durable materials and designed with your child’s safety in mind. A unique, high backrest for extra support sets this swing apart. It is fully enclosed and it features plastisol-covered steels chains--much stronger than rope--to protect fingers. Be sure to check out Love, Mrs. Mommy's Eastern Jungle Gym review HERE! Disclosure: Love, Mrs. Mommy and all participating bloggers are not held responsible for sponsors who do not fulfill their prize obligations. Love, Mrs. Mommy received a swing set at no cost to facilitate the above-mentioned review. This giveaway is in no way endorsed or sponsored by Facebook or any other social media site. The winner will be randomly drawn by Giveaway Tools and will be notified by email. The winner has 48 hours to reply before a new winner will be drawn. If you would like to participate in an event like this please contact LoveMrsMommy (at) gmail (dot) com.